MOSCOW, February 22. /TASS/. Russian President Vladimir Putin emphasized on Thursday the importance of trust between different countries in military affairs. "As people in uniform you have a special attitude to weapons, to the army and to the whole military component of the state," the president said at a meeting with the leadership of the defense ministries from some countries invited to a gala meeting devoted to Fatherland Defender's Day, which Russia marks as a major national holiday on February 23. "Like nobody else, you understand how careful must be the attitude to this, and how highly trust is valued in such a sensitive sphere as military affairs," the president added. "Patriotism is in the national character of our people, and we know how heroic people become when the Fatherland is in danger. Saving the Fatherland, being ready to shield a combat friend, protect those who are dear to you - this is always stronger than any, even the gravest ordeals," Putin said. He said the whole country marks Fatherland Defender’s Day with a feeling of sincere and deep respect for those who protect the country, ensuing peace for its nationals. "Military service to the glory of the Fatherland has always been reputed here. Russia has many times countered foreign threats, infringements on its independence," Putin said, stressing that "our soldiers, sailors and officers have courageously defended the country, winning not only due to their operating proficiency, strength of arms, but also due to moral courage and great love for the Fatherland". He cited as an example the Battle of Stalingrad, which "in its entirety revealed the victorious unity of the army and the people". Taking part in the meeting with the Russian leader were ministers and deputies to the ministers of Armenia, Venezuela, Kazakhstan, Qatar, Mongolia, Serbia, Uzbekistan, Belarus, Azerbaijan and Kyrgyzstan. Russian Defense Minister Sergey Shoigu also took part in the meeting. Russia has gotten to the top positions in the world in terms of combat efficiency of its forces and has thus guaranteed its own security, the president said. "Developments of the past several years have shown we've gotten to the top positions in the world if you take our combat efficiency and the quality of defense technologies," he said. "We can say with assuredness today that Russia has guaranteed its own security." Putin said these efforts would move on and the country's defense capability would increase further in all of its component aspects. He also promised the Russian government would invest the consolidation of strategic nuclear deterrence resources. "We’ll draw on the potential of our defense industry, its best enterprises, as well as the achievements of our research centers and design bureaus," Putin said. "They’ve already proved their competence and global competitiveness." He stressed the special role of the corps of Armed Forces officers and commanders of all levels in the buildup of Russia’s defense potential. The officers’ professionalism, ability to operate top-notch technologies, and perfect knowledge of military science form the basis for a successful fulfilling of new-format combat tasks. "Quite naturally, an officer should be a true tutor, an attentive and demanding father and commander like it has always been in the past," Putin said. "He should set the example of selfless service and keep up commitment to the traditions fostered by generations of this country’s officers.". Russian military engaged in the operation in Syria have shown superior training, resolve and courage, he went on. "I'd like to thank everyone who have been taking part in the combat operation on the Syrian territory," he said. "Our servicemen have superior training and perform their duties with dignity. They are fighting resolutely, courageously and to the end." 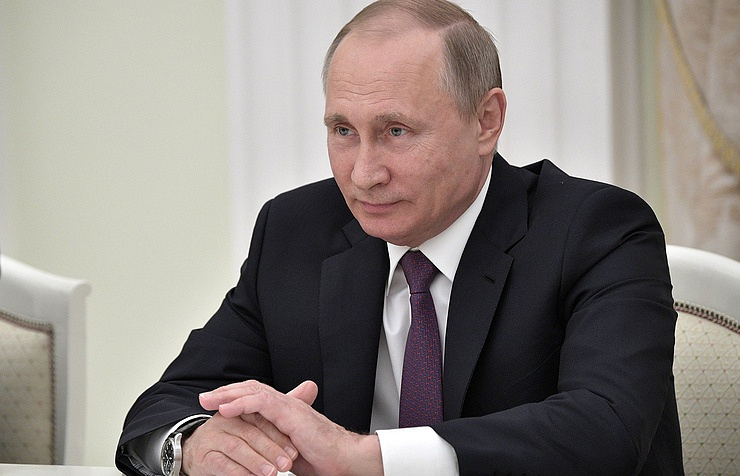 On February 23, Putin is expected to hold a ceremony of handing state awards time for Fatherland Defender’s Day. "Among other things, Putin will hand the Gold Star of Hero of the Russian Federation to the relatives of Aerospace Force Maj. Roman Filipov, who died in Syria recently," the Kremlin press service said. Maj. Filipov died on February 3, 2018, after the Sukhoi-25 fighter jet he was piloting had been brought down over the Idlib de-escalation zone by a missile launched from a shoulder-carried antiaircraft launcher. He managed to catapult but had to engage in an unequal fight with the terrorists on the ground. After finding out that the militants had encircled him, he blew himself up with a hand grenade. President Putin, who is the Commander-in-Chief of the Russian Armed Forces, decorated him posthumously with the title of Hero of Russia.